The Port of Longview in the USA has been in discussion with potential customers to handle biomass cargoes at its Berth 2 dry bulk facility. With the worldwide boom in biomass use — and distribution — the port plans to be ready to diversify. 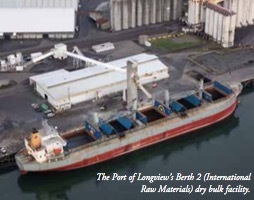 The Port of Longview’s Business Development Manager, Laurie Nelson-Cooley, says: “We have been discussing the possibility of biomass exports out of Longview with several developers who have interest in white pellets or torrefied pellets for Asian markets.We have not added any new infrastructure for future exports. However, Bridgeview Terminal is an excellent opportunity.